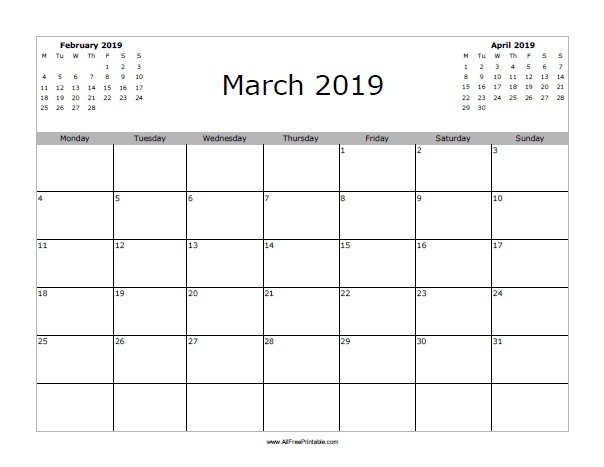 Free Printable March 2019 Calendar. Free Printable March 2019 blank Calendar with previous and next month. If you need a free blank calendar to organize this month and remember important days, this calendar can help. Great for the classroom, work place, and for home too. Select the free printable March 2019 calendar starting the week on Monday or Sunday. Use the free printable March 2019 calendar to write all that matters to you, like job task, school test, due dates, home task, workout, business meeting, schedule, Car maintenance, diet, menu, health notes, birthdays, things to do today and more. Use the link of your choice to download or print now.